Whelp – we’ve finally started – our year-round homeschooling journey! Before I go any further, this does not mean that we’re doing school 52 weeks a year. Rather, it means our schooling is spread out a little more through-out the year to allow for more breaks, instead of all the free time being clumped in the summer. 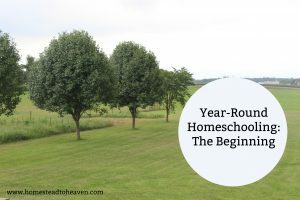 Our school year started on July 23rd with a week break after the first three weeks, so that puts us at week 6 in our home school year. We started out full of anticipation, with a lovely spread of learning ahead of us. Now, at week 6, we’ve started learn what to tweak in our routine and what to trim from our curriculum. I had also set aside 1-on-1 time with each kid for 30 minutes to do math and phonics. That’s 1 1/2 hours for two subjects that don’t need that much time in these early years. Last week I started having the all kids do math at the same time instead of 1-on-1. It seems to be working out pretty well, but I’m still tweaking it a bit as it can be chaotic at times. Then I still do about 15 minutes worth of phonics 1-on-1 with each kid. The rest of the day pretty much goes as planned. I’ll share more of what we’re doing in another post.